This study has 10 sessions, incorporating an introductory session and 9 lessons. The Study Set includes a Study Guide by Catherine Upchurch and a commentary, 'The God of Freedom and Life,' by Stephen J. Binz (Liturgical Press). Stephen J. Binz is a Catholic biblical scholar, speaker, and counselor. He did graduate studies at the Pontifical Biblical Institute in Rome and is a member of the Catholic Biblical Association and the Society of Biblical Literature. Binz is the author of several companion commentaries to Little Rock Scripture Studies, including Advent of the Savior (Liturgical Press), the companion commentary to Little Rock Scripture Study The Infancy Narratives of Jesus, Introduction to the Bible, (Liturgical Press) the companion commentary to Little Rock Scripture Study of the same name, The Passion and Resurrection Narratives of Jesus (Liturgical Press), the companion commentary to Little Rock Scripture Study of the same name. The Exodus is the central event of the Old Testament. 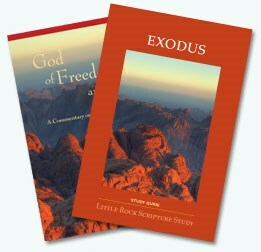 Its themes of liberation wilderness passover covenant and God's dwelling are central for the whole Bible. It tells the story of God calling Moses to be the prophet through whom God will lead the people to freedom from slavery in Egypt and their struggles to learn faithfulness in the wilderness where God makes covenant with them. The 10 commandments form the ethical core of this covenant while the instructions for building a tent of worship accentuate God's intention to dwell in the midst of the people.